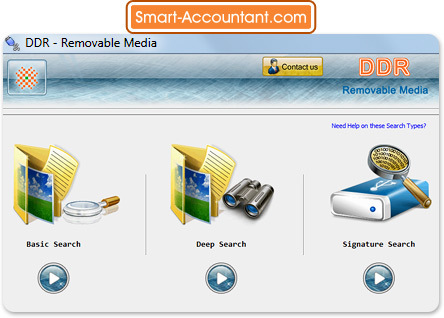 Introduction-Removable Media Data Recovery Software is read only and non destructive data recovery tool for restoring deleted or lost files/folders (such as jpeg, jpg, txt, rft, mpeg, mpg, bmp, wav, mp3 etc) from unintentionally formatted or corrupted removable media in all major capacities. File retrieval utility provides an easiest way to rescue missing or invalid data after windows data loss reason and restores data from inaccessible removable device. Data retrieval tool is simple and reliable utility to undelete or unformat corrupted files and shows recovered files list in hierarchy structure after disk scanning by Standard Search or Advance Search. Recovery data process allows you to review recovered files and facilitates to save data at new or specified location. Affordable disk revival software restores data even if data deleted by using Shift+Delete key and get previously existing data after the reformation of removal disk drive. Easy to use recovery software provides systematic help menu for technical and non technical users. Where Does Removable Media Data Recovery Software Work? Restore lost, missing or misplaced files and folders such as text, pictures, digital images, audio and video files. Undelete deleted data from reformatted or corrupted removable media. Recover formatted or invalid file formats such as txt, doc, rtf, jpeg, jpg, bmp, mpg, mpeg, wma, mp3, mp4, tiff, mid, midi, thmb, etc. Revive data in its original form with folder name, icon and date. Support all type of removable media such as pen drive, thumb drive, memory card, flash card, USB drive, compact drive, smart drive, memory stick, zip drive etc. Supported major manufacturers of removable media including Acer, BenQ, Casio, Canon, Fuji Film, HP, Jet Flash, Kingston, Pentax, Panasonic, Ricoh, Sony, Samsung, Vivitar, Yakumo etc. Software supports all type of removable devices in all major data storage capacities. Revive data even if device type not found by the computer system. Preview recovered data in tree structure format after the disk scanning. Facilitate with user guide for user’s assist.